TORONTO and TAMPA, FL, May 3, 2018 /PRNewswire/ - Cott Corporation (NYSE:COT; TSX:BCB) today announced its results for the first quarter ended March 31, 2018. Following the closing of the sale of Cott's traditional business on January 30, 2018, Cott became a pure play water, coffee and filtration business. 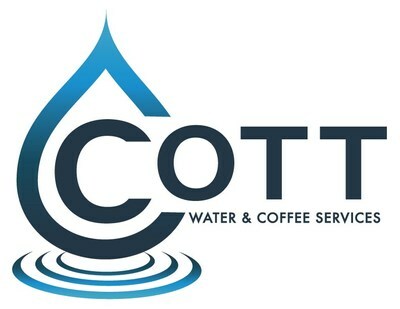 In keeping with Cott's new "better for you" business focus, Cott has updated its corporate logo to reflect its new business of water and coffee services. Revenue increased 4% (3% excluding the impact of foreign exchange and adjusted for comparable trading days) to $561 million compared to $537 million. Reported net income and net income per diluted share were $5 million and $0.03, respectively. Adjusted EBITDA increased 8% to $65 million. Cott completed the sale of its traditional beverage manufacturing business to Refresco Group N.V. ("Refresco") on January 30, 2018 for $1.25 billion, of which approximately $1.1 billion of proceeds were utilized to repay outstanding debt (inclusive of principal, premium and interest payments). As of March 31, 2018, Cott's leverage was 3.6 times (net debt to LTM adjusted EBITDA). On March 23, 2018, Cott completed the acquisition of Crystal Rock Holdings, Inc., a direct-to-consumer home and office water, coffee, and filtration services business. On April 9, 2018, Cott sold its PolyCycle Solutions assets to Consolidated Container Company. The net impact of these two transactions on 2018 revenues is expected to be an increase of approximately $30 million. Cott increased targeted full year 2018 revenues to over $2.35 billion to reflect the Crystal Rock and PolyCycle transactions. Cott increased targeted full year 2018 cash flow provided by operations to reflect the Crystal Rock and PolyCycle transactions to approximately $235 million with capital expenditures in the range of $115 to $120 million, resulting in adjusted free cash flow of $115 to $120 million (when excluding acquisition, integration, and other working capital adjustments). On May 1, 2018, Cott's Board of Directors approved a $50 million share repurchase plan. "I am pleased with the activity undertaken and the results of the first quarter. In addition to our continuing revenue and EBITDA growth, we closed on the sale of our traditional business which reduced our debt by around $1 billion, we received approval from our Board of Directors to rebrand Cott's corporate identity to reflect the change in the business and approved a stock repurchase program," commented Jerry Fowden, Cott's Chief Executive Officer. Gross profit increased 2% to $274 million, driven primarily by revenue growth within our operating segments, offset in part by increases in previously disclosed freight costs within our Route Based Services segment alongside a change in customer mix within our Coffee, Tea and Extract solutions segment. Interest expense was $21 million. The proceeds from the sale of our traditional business were used to redeem the remaining $250 million of our 10% DS senior secured notes and $525 million of our 5.375% notes, and to pay off the outstanding balance on our asset-based lending facility. As a result, interest expense is expected to be approximately $57 million for the remainder of 2018 or $78 million in total for fiscal year 2018. Reported net income and net income per diluted share were $5 million and $0.03, respectively, compared to reported net loss and net loss per diluted share of $10 million and $0.07, respectively. Reported EBITDA was $74 million compared to $50 million in the prior year. Adjusted EBITDA increased 8% to $65 million driven primarily by revenue growth within our operating segments. Net cash provided by operating activities of $23 million, less $30 million of capital expenditures resulted in free cash flow of ($7) million or $7 million of adjusted free cash flow (adjusted for acquisition, integration, and other working capital adjustments) compared to adjusted free cash flow of $9 million in the prior year. Revenue increased 5% (2% excluding the impact of foreign exchange and adjusted for comparable trading days) to $371 million. A detailed breakdown is tabulated below. Gross profit increased 3% to $228 million, driven primarily by increased revenue, offset in part by freight and transportation costs. Operating income increased 32% to $12 million, due primarily to the increase in gross profit. Revenue increased 2% (5% adjusted for comparable trading days) driven primarily by 3% growth in coffee pounds sold (7% adjusted for comparable trading days) and growth in liquid coffee and extracts. Gross profit was $39 million compared to $42 million due to a $2 million commodity hedging gain recorded in the prior year as well as fewer trading days. Operating income was $4 million compared to $6 million due to a $2 million commodity hedging gain recorded in the prior year as well as fewer trading days. Cott increased the targeted full year 2018 consolidated revenue to over $2.35 billion and full year 2018 cash flow provided by operations to approximately $235 million with capital expenditures in the range of $115 to $120 million, resulting in adjusted free cash flow of $115 to $120 million (when excluding acquisition, integration, and other working capital adjustments). Green coffee commodity market prices have been declining since the end of 2016. At current rates, in conjunction with the timing of various pricing agreements, we would expect to see a 0.5% to 1% lowering of our quarterly consolidated revenues with a corresponding reduction to cost of goods sold. As a majority of our coffee purchases are incorporated into our hedging program, the changes in pricing will operate similar to a pass-through mechanism and as a result our profitability will not be materially impacted by revenue impacts caused by the market movement in green coffee prices. Cott's board of directors has determined that the repurchase of a portion of Cott's outstanding common shares is an appropriate use of available cash and is in the best interests of Cott and its shareowners. In order to facilitate repurchases, the Toronto Stock Exchange ("TSX") has approved Cott's notice of intention to make a normal course issuer bid for a portion of its common shares as appropriate opportunities arise from time to time. The total size of the repurchase is capped at $50 million. Repurchases will be made through the facilities of the TSX, the New York Stock Exchange ("NYSE") and other alternative Canadian trading systems in accordance with applicable regulatory requirements, including Rule 10b-18 of the Securities Exchange Act of 1934. Cott may begin to purchase common shares on or about May 7, 2018. As of April 23, 2018, Cott's public float was 137,685,569 common shares, with 140,188,624 common shares issued and outstanding. Pursuant to the notice, up to 10% of the public float, or 13,768,557 common shares, may be repurchased during the 12-month period commencing May 7, 2018 and ending on May 6, 2019, subject to the aggregate $50 million cap. Of this amount, up to 7,009,431 common shares may be repurchased through the facilities of the NYSE. Common shares will be repurchased at then-current market prices. Pursuant to the TSX rules, the maximum number of common shares that may be repurchased during a single trading day on the TSX is 38,601, representing 25% of the average daily trading volume of 154,406 of Cott's common shares on the TSX for the past six months, subject to certain exceptions for block repurchases. Rule 10b-18 contains similar volume-based restrictions on daily purchases on the NYSE, subject to certain exceptions for block repurchases. Cott will fund the purchases through cash on hand, and repurchased common shares will be cancelled. The notice of intention provides that no appraisal or valuation regarding Cott, its material assets or securities, has been prepared within the two years preceding the date of the notice. To the knowledge of Cott, no director, senior officer or other insider of Cott currently intends to sell any Common Shares under the bid. However, sales by such persons through the facilities of the TSX or NYSE may occur if the personal circumstances of any such person change or any such person makes a decision unrelated to these normal course purchases. The benefits to any such person whose Common Shares are purchased would be the same as the benefits available to all other securityholders whose Common Shares are purchased. Cott will enter into an automatic purchase plan in relation to purchases under the normal course issuer bid. The automatic purchase plan will allow for the purchase of Common Shares, subject to certain trading parameters, at times when Cott ordinarily would not be active in the market due to its own internal trading black-out period, insider trading rules or otherwise. Outside of these periods, Common Shares may also be repurchased in accordance with management's discretion and in compliance with applicable law. "We are pleased to announce today that a share repurchase program has been approved by our Board of Directors and the TSX. This program is an integral part of our capital deployment strategy which also incorporates an acceleration of our complementary tuck-in acquisition plan," commented Mr. Fowden. A live audio webcast will be available through Cott's website at http://www.cott.com. The earnings conference call will be recorded and archived for playback on the investor relations section of the website for a period of two weeks following the event. To supplement its reporting of financial measures determined in accordance with GAAP, Cott utilizes certain non-GAAP financial measures. Cott excludes from GAAP revenue the impact of foreign exchange and the impact of additional trading days in the prior period to separate the impact of these factors from Cott's results of operations. Cott utilizes EBITDA and adjusted EBITDA on a global basis to separate the impact of certain items from the underlying business. Because Cott uses these adjusted financial results in the management of its business, management believes this supplemental information is useful to investors for their independent evaluation and understanding of Cott's underlying business performance and the performance of its management. Additionally, Cott supplements its reporting of net cash provided by (used in) operating activities determined in accordance with GAAP by excluding additions to property, plant & equipment to present free cash flow, and by excluding acquisition and integration cash costs as well as a working capital adjustment related to the Concentrate Supply Agreement with Refresco to present adjusted free cash flow, which management believes provides useful information to investors about the amount of cash generated by the business that, after the acquisition of property and equipment, can be used for strategic opportunities, including investing in our business, making strategic acquisitions, paying dividends, repurchasing common shares, and strengthening the balance sheet. The non-GAAP financial measures described above are in addition to, and not meant to be considered superior to, or a substitute for, Cott's financial statements prepared in accordance with GAAP. In addition, the non-GAAP financial measures included in this earnings announcement reflect management's judgment of particular items, and may be different from, and therefore may not be comparable to, similarly titled measures reported by other companies. Factors that could cause actual results to differ materially from those described in this press release include, among others: our ability to compete successfully in the markets in which we operate; fluctuations in commodity prices and our ability to pass on increased costs to our customers or hedge against such rising costs and the impact of those increased prices on our volumes; our ability to manage our operations successfully; our ability to fully realize the potential benefit of acquisitions or other strategic opportunities that we pursue; potential liabilities associated with the Refresco transaction; our ability to realize the revenue and cost synergies of recent acquisitions because of integration difficulties and other challenges; the limited nature of our indemnification rights under the acquisition agreements for our recent acquisitions; our exposure to intangible asset risk; currency fluctuations that adversely affect the exchange between the U.S. dollar and the British pound sterling, the Euro, the Canadian dollar, and other currencies; our ability to maintain favorable arrangements and relationships with our suppliers; our ability to meet our obligations under our debt agreements, and risks of further increases to our indebtedness; our ability to maintain compliance with the covenants and conditions under our debt agreements; fluctuations in interest rates, which could increase our borrowing costs; the incurrence of substantial indebtedness to finance our recent acquisitions; the impact of global financial events on our financial results; credit rating changes; our ability to fully realize the expected cost savings and/or operating efficiencies from our restructuring activities; any disruption to production at our manufacturing facilities; our ability to maintain access to our water sources; our ability to protect our intellectual property; compliance with product health and safety standards; liability for injury or illness caused by the consumption of contaminated products; liability and damage to our reputation as a result of litigation or legal proceedings; changes in the legal and regulatory environment in which we operate; the seasonal nature of our business and the effect of adverse weather conditions; the impact of national, regional and global events, including those of a political, economic, business and competitive nature; our ability to recruit, retain, and integrate new management; our ability to renew our collective bargaining agreements on satisfactory terms; disruptions in our information systems; our ability to securely maintain our customers' confidential or credit card information, or other private data relating to our employees or our company; our ability to maintain our quarterly dividend; our ability to adequately address the challenges and risks associated with our international operations and address difficulties in complying with laws and regulations including the U.S. Foreign Corrupt Practices Act and the U.K. Bribery Act of 2010; our ability to use net operating losses to offset future taxable income; and the potential impact of the 2017 Tax Cuts and Jobs Act on our tax obligations and effective tax rate. 1Includes related party concentrate sales to discontinued operations. 2Gross profit from external and related party revenues. 1Cott includes the following reporting segments: Route Based Services, Coffee, Tea and Extract Solutions and All Other. 2 Impact of foreign exchange is the difference between the current period revenue translated utilizing the current period average foreign exchange rates less the current period revenue translated utilizing the prior period average foreign exchange rates. 3 Our Eden business had two fewer trading days, our S&D business had three fewer trading days, and our Aimia business had one fewer trading day for the three months ended March 31, 2018 as compared to the prior year period. and April 1, 2017, respectively, related to awards granted in connection with the acquisition of our S&D and Eden businesses. 1 Increase in working capital related to the Concentrate Supply Agreement with Refresco in connection with the Transaction. 2 Excludes $12.5 million of cash proceeds received from the sale of the Traditional Business that was held in escrow as of March 31, 2018. 1Includes $3.5 million of share-based compensation costs for the year ended December 30, 2017, and $1.0 million and $1.3 million of share-based compensation costs for the three months ended March 31, 2018 and April 1, 2017, respectively, related to awards granted in connection with the acquisitions of our S&D and Eden.